You might have seen the pictures on your social media feeds - graphic images of burned villages and injured or dead people. Or you might not. People circulating these pictures are complaining no-one is listening - but they could be in an echo chamber, with their comments reaching only people who care about the same issue. Around a million tweets have been sent regarding the recent upsurge in violence in Myanmar. Memes and numerous hashtags are circulating, and Malala Yousafazai, the 20-year-old Nobel prize winner, tweeted a statement which has reached approximately 73,000 times. So what is behind this huge online storm? Since 25 August, at least 123,000 people are believed to have fled to Bangladesh from Myanmar (also called Burma), in Southeast Asia. They are men, women and children from the persecuted Rohingya ethnic minority, who have now become refugees. Many fleeing describe Burmese military and Rakhine Buddhist mobs razing villages and killing civilians. There is deep-seated tension between this mostly Muslim group and the majority Buddhist population. Thousands of Buddhist villagers in Rakhine are also reported to have fled south after attacks on their communities. There has also been a military crackdown in Myanmar following Rohingya militants' attacks against police posts and killing 12 members of the security forces in late August. The conflict is generating huge online reaction, particularly by people expressing solidarity with refugees fleeing Burma, whilst some highlight violence by Arakan Rohingya Salvation Army militants. In the past week at least 1.2 million tweets have been sent including the word 'Rohingya'. A further 956,000 included 'Myanmar', and 220,000 included 'Burma'. Hastags included #RohingyaMuslims with 55,000 tweets, #PrayForRohingya with 25,000 tweets, and #WeAreAllRohingya with 1000 tweets. Many claim Muslims are being deliberately targeted and that far more have died than the 400 reported by the Burmese military. The authorities say most of these 400 were militants. However, independent verification of many of the claims, and of footage, is difficult due to severe restrictions on reporting. The people tweeting are spread across the globe, but are largely in Muslim-majority countries including Indonesia, Bangladesh, and Malaysia. The United States and United Kingdom were also in the top ten. One widely-shared meme shared on Facebook and Twitter shows four pictures of children from Muslim-majority countries who have become emblems of global conflict. They include Aylan Kurdi, the Syrian boy trying to reach Greece whose body was found drowned on a Turkish beach in 2015. 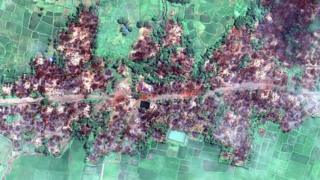 Human Rights Watch published a satellite image showing burnings of villages in 10 areas in Burma, in a tweet shared 3,500 times. Some social media users, including Professor Rula Jebreal in Rome, allege there is less interest in the issue because the victims are Muslim. However, there has been widespread newspaper and TV bulletin coverage of the issue. The BBC has published at least 17 articles online about the violence since 25 August. Like Malala Yousafazai, many on social media are critical of Myanmar's de facto leader and Nobel Peace laureate Aung San Suu Kyi, claiming she is failing to protect the minority. In Russia #Myanmar was trending on Monday and Tuesday after a pro-Rohingya protest by Russian Muslims in Moscow and in Chechnya. Commentators claimed Russian police allowed the unauthorised protests to proceed, in contrast to opposition rallies earlier this year. "This is the first mass unauthorised rally in the centre of Moscow in recent times but the police don't interfere," photoblogger Ilya Varlamov wrote on his blog. Today, as the UN reported there is no space in camps in Bangladesh for for newly arrived refugees, there are few signs that social media outpouring will abate.